[PREMIUM] Assign point values to questions and automate your grading. 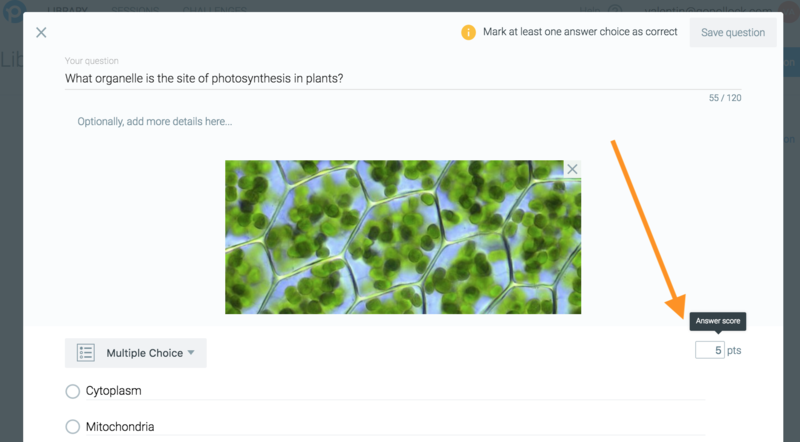 With Classtime Premium, you can assign point values to each Question and let Classtime do the scoring for you. You will be able to see all results in your Session Dashboard and can also conveniently export everything in an Excel spreadsheet. To get started, assign a certain point value to each question you create or edit. In your Library, open the Question you would like to edit and locate the point value field on the right. By default, each question is assigned with 1 point. You can increase the points as you want; you can also use 0 as a value if you do not want the question to influence the overall student score. Decimal points, such as 1.5, are currently not supported. 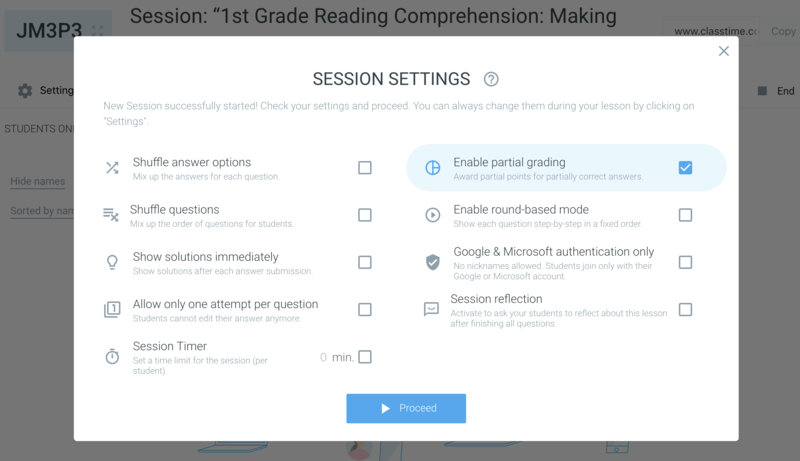 As soon as student responses come in, Classtime will validate and grade them automatically. The only exception is a free text question type, which will require you to mark it as correct or incorrect once before the system learns and automatically applies the validation to all future identical answers as well. Partial grading applies to the following question types: Checkboxes, Categorizer, Sorter, and Highlight Text. 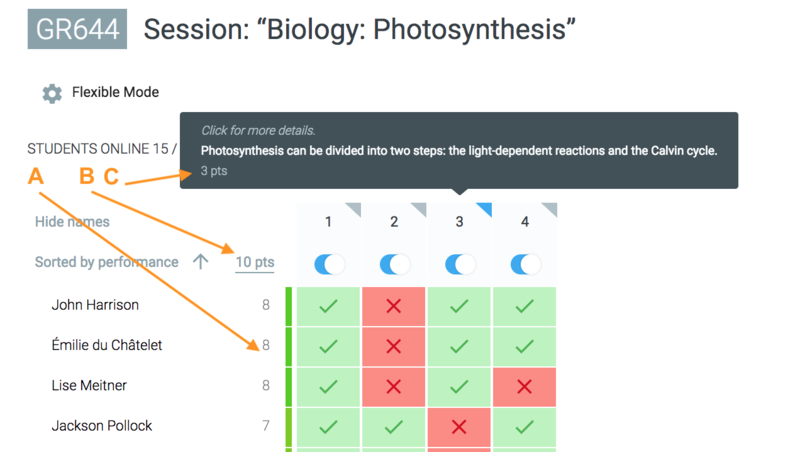 Checkboxes: Students get partial points for every answer option that they check correctly. If they a) check an incorrect answer option b) forget to check a correct answer, they will receive a partial point penalty. This disincentivizes students to simply guess and check all answer options. The exact calculation is: (correctly checked answers - incorrectly checked answers) / total possible correct answers. Example: (2 correct - 1 incorrect) / 2 total correct = 1/2 = 0.5 points earned. Categorizer: for every correct selection, the student will receive a partial point. As all rows need at least one answer, there is no penalty. Example: 3 answer options (1/3 points each), with two out of three correct: 0.7 points (0.66). Weighted points and grading is a Classtime Premium feature. Please remember that you can always export all student answers and scores with out Excel export. From there, you can make optional edits, import it into Google Sheets, save it locally or share it with students, parents and other parties.